George Graham Reviews Yorkstone/Thorne/Khan's "Neuk Wight Delhi All-Stars"
Stylistic fusion in music can be fun. Sometimes it seems as if artists are trying their best to smash together genres that are as different as possible just to see what happens. Sometimes the result can be a bit of a musical train-wreck or very esoteric, but occasionally some interesting and engaging music can ensue. An extra measure of eclecticism can be added when one the one of the musical ingredients is something a bit exotic such as non-Western music. This week we have a good example of the latter, it’s by a the trio Yorkston/Thorne/Khan, from the UK, and their new release is called Neuk Wight Delhi All-Stars. Yorkston, Thorne and Khan are from the UK and their particular mixture is a confluence of English-style folk, a prominent jazzy acoustic bass, and classical Indian influence, with the instrumentation and tonalities from the sub-continent. And rather than trying to blend the influences all the time, many of the pieces on the album move back and forth between British Isles folk and a distinctly Indian sound. Yorkston/Thorne/Khan are James Yorkston, a singer-songwriter guitarist who has been part of the English folk scene with his own music who has also performed with luminaries such as Martin Carthy and the late Bert Yansch. He released released at least seven albums in the UK since 2002, and authored a novel last year called Three Craws. Jon Thorne is the acoustic bassist and was a member of a band called Lamb, and has also worked with King Crimson’s Robert Fripp, and the American band Iron & Wine. Suhail Yusuf Khan plays the sarangi, a bowed string instrument from India and Nepal, and lends his Indian vocal style to the album. His grandfather, Ustad Subri Khan played with George Harrison, Ravi Shankar and classical violinist Yehudi Menuhin. This trio got it start when Yorkston and Khan met by chance back stage at a concert in Edinburgh, Scotland. They became friends and began to make music fusing their styles in a way that flowed from their working together. The album’s title Neuk Wight Delhi All-Stars comes from the home area of each of the players, James Yorkston from East Neuk in Scotland, Jon Thorne from the Isle of Wight in the south of England, and Suhail Yusuf Khan from New Delhi in India. Neuk Wight Delhi All-Stars is the trio’s second album after a debut, called Everything’s Sacred released in 2016. The new album is a mixture of original pieces by all three separately, and some traditional material, along with one obscure cover by Roger Eno. Yorkston has a kind of classic English folk sound, though he also can bring in some Celtic influence. Thorne plays bass much in the style and tone of Danny Thompson, whose sound came to define a lot of the English folk scene as a member of the Pentangle and a collaborator with many others on the scene. Khan brings his distinctive Indian approach with its tonality and unconventional musical scales, though he can also provide some more Western-style singing. Neuk Wight Delhi All-Stars, the new release by James Yorkston, Jon Thorne and Suhail Yusuf Khan is another example of an unlikely fusion of very different styles that works surprisingly well. The confluence of English folk style with traditional Indian sound makes for a study in contrasts. Unlike some such fusion efforts, the trio often keeps the influences somewhat separated, with the styles seeming sometimes to take turns within a tune. But the result is satisfying and appealing. The music also evokes a retro quality with the Indian influence reminiscent of the psychedelic scene, and the English folk sound conjuring groups like the Pentangle. It’s a creative blend that has an organic quality, with the music arising from the association, rather than having it set out from a plan. Our grade for sound quality is an “A-minus” with the instrumentation reasonably well-recorded but lacking much sparkle to the sound. The dynamic range, how well the music’s ebb and flow is reproduced, is better than average in these days of heavily compressed sound. There are a lot of possible permutations for fusing combinations of styles. For me, some of the most creative music over the last several years has come about through such efforts, though others have come across as mere novelties. 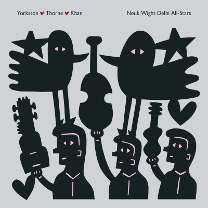 Neuk Wight Delhi All-Stars by the trio Yorkston, Thorne, Khan is one of those imaginative musical conglomerations that makes for very engaging listening.